So before you worshippers get excited about the famous overclouded “darshan of Sathya Sai Baba on the face of the moon” and look for photos from other times and place, first send such photos to NASA for proper confirmation that Sathya Sai Baba DOES figure on the moon …if you don’t want to look like a literal lunatic. Better to become world famous for discovering the unprecedented astronomical phenomenon, eh? Remember, the moon is under constant observation by hundreds of telescopes and thousands of serious supporting amateur astronomers. Be sure that your photo will most certainly be given the closest of attention. All this would have amused the famous Rorschach considerably. However, it later transpired that Sai Baba was applauded by hundreds of devotees who were gathered to view this amazing phenomenon of his appearing on the face of the moon (date unknown), if the video on YouTube is what it claims to be!! 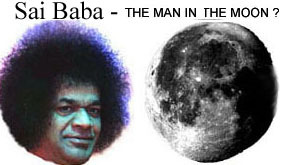 SEE THE SAI BABA MOON VIDEO HERE! Only problem is that, in this case it was not SATHYA Sai Baba who they were applauding, but the entirely different looking SHIRDI Sai Baba (who left the body early last century) ! One has to wonder… is are these highly elusive lunar appearances of the nature of a competition between opposed religious camps of followers? Or are they simply delusions which are related to mental derangement through indoctrinated beliefs, and thus closer to lunacy even than lunar worship? Devotees of both Sai Babas see what they want to see with all manner of unbelievable ‘miracles’ that hearsay claims their gurus have performed. Sai Baba ‘postpones’ moon appearance! 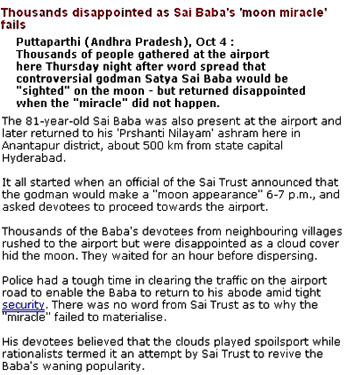 Sai Baba alleged mystical moon miracles galore! Photos supposedly showing Sathya Sai Baba on the moon??? I have already shown how quite other faces can just as well be seen – Jimi Hendrix, a serial killer called Tookie Williams, and another face… Now there are other things the eager beaver can see:- maps of parts of Asia, even India there. Admittedly, this is more interesting than green cheese. People believe anything, see anything hear anything… all according to what they want to see, hear, believe. As if it made any difference other than to fool some poor souls into thinking that Sathya Sai Baba is able actually to influence the moon’s appearance!> And to think that India’s ex-President Kalam, Prime Minister Manoman Singh , India’s President Pratibha Patil and a whole list of other top Indian Government ministers, judges and still believe in a person who makes such pointless and bogus claims as he did over this according to his closest servitor, Anil Kumar, in a public announcement! Remember the propaganda, Sathya Sai Baba claims outright to be the Creator of the Universe – nothing less than that! It is both laughable and tragic (for India’s reputation). Someone wrote a comment to me saying that Sai Baba never said he would appear on the moon. The same was asserted by Gerald Joe Moreno on one of his thousands of web pages attacking critics of SB and who is famously in total denial about every sensitive fact about Sathya Sai Baba. These are typical symptoms of near-pathological denial or, at best, the regurgitation of disinformation. It is an attempt to explain away the undeniable facts of the matter so as to retain faith in this deceiving guru and self-declared incarnation of all Divine entities rolled into one! What does Sathya Sai Baba say about it now? Nothing!! Nowhere can one discover that he has denied it or mentioned it at all. As all who have been close to him know, he only lets people know what he wants them to believe. He answers only those questions he wishes, and ignored most questions. His officials are remarkably silent about the entire issue. Even were they to make an announcement, one could be almost certain it will be a deception. They are notorious for twisting the facts about him (particularly when he repeatedly has broken his hip, his arm, lost an eye etc. some claiming he is in full vigour and perfect health (though anyone can discover how decrepit and senile he is, besides not being able to speak clearly and so not hold any more boring discourses). With the former huge sums of donated money falling off, every effort is made by the ashram and the Sathya Sai Organization (through internal circulars) to keep devotees in the dark. Strange indeed that so many devotees claim to have seen this (here)? Even the semi-official saibabaofindia.com websiteclaims this. Strange that he went to the airport where Anil Kumar told everyone to go for the moon darshan (according to numerous news reports shortly thereafter such as Sai-affiliated Sify.com here) and strange he got stuck in his car in the crown of 20,000 for a long time until he had to go back. Strange that the sky was clouded over too?